Christe redemptor omnium is prescribed in the Antiphonale Monasticum as a hymn at First Vespers of the Feast of the Nativity of Our Lord. 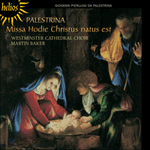 It is one of a substantial collection of settings by Palestrina of hymns for seasonal use which was published in 1589 in Rome by Francisco Coattino. This six-part hymn is an alternatim composition—that is, alternate verses of the hymn are set to chant and polyphony, and the prominence of the plainsong in the composition is enhanced by the way that the melody of the chant, or fragments of it, are present in slow notes much of the time in one or other of the voices. This a wonderfully rich composition which uses a great variety of musical techniques to illuminate the meaning of the words, one example of which is the lively triple-time section at the words ‘praising and raising songs of exultation’. Christe redemptor omnium est prescrit dans le Antiphonale Monasticum en tant que chant des Premières Vêpres de la Fête de la Nativité. Il fait partie d’une collection importante d’arrangements par Palestrina de chants pour l’année liturgique, publiée à Rome en 1589 par Francisco Coattino. Ce chant à six voix est une composition de type alternatim, c’est-à-dire aux versets alternés plain-chant et polyphonie, le plain-chant étant mis en valeur dans cette composition par la manière dont la mélodie du chant, ou ses fragments, est présentée par des notes lentes la plupart du temps dans l’une ou l’autre des voix. Composition merveilleusement riche, elle a recours à de nombreuses techniques musicales pour éclairer le sens des mots comme, par exemple, dans la section animée à trois temps, «chants de gloire et de louange». Christe redemptor omnium ist im Antiphonale Monasticum als Hymnus der ersten Vesper des Weihnachtsfest verzeichnet. Es gehört zu einer beachtlichen Sammlung von Hymnusvertonungen Palestrinas, die 1589 in Rom von Francisco Coattino herausgegeben wurden. Dieser sechsstimmige Hymnus ist eine Alternatimskomposition, d.h. homophon vertonte Strophen alternieren mit polyphonen Strophen. Die führende Rolle des Cantus planus wird noch verstärkt, indem die Melodieteile des Chorals meistens in einer der Stimmen in den langsamen Noten präsent sind. Es ist dies eine sehr reichhaltige Komposition, in der viele musikalische Stilmittel verwendet werden, um die Bedeutung des Textes zu erhellen, wie etwa in der lebhaften Dreiertaktpassage bei den Worten „lobt und stimmt Jubellieder an“. throughout the world, thy servants pour out. once thou tookest on human form. thou camest, salvation of the world. to the author of thy advent. join together in raising a new song of praise.